standards that no longer set water quality objectives at the plant outlet but, instead, at the consumer's tap, apply to water that has an extremely high physical-chemical and biological "stability" (that does not alter through the distribution network). accordingly, the polishing stage remains an essential aspect but will only be fully effective if clarification has been optimised; also, under these conditions, it will be possible to reduce the potential emergence of unwanted by products (THM, HAA...) to a minimum during oxidation or final disinfection stages. 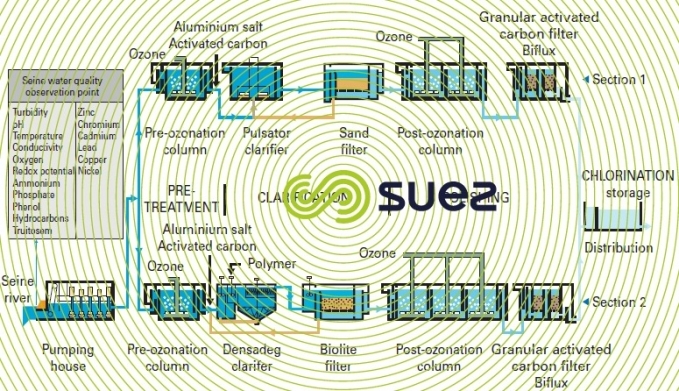 These considerations imply a particular need to target an increasingly complete removal of organic matter; in practice, this will first take the form of optimised clarification operating conditions (coagulant dosage, flocculation pH, pre-ozonation, use of powdered activated carbon…), together with the inclusion of complementary treatment stages such as the use of ozone oxidation followedby a second filtration using specific materials (e.g. 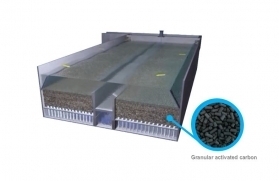 GAC, biolite), in order to simultaneously achieve, physical filtration as well as biofiltration and/or adsorption, that is effective on dissolved forms of carbonaceous and nitrogenous contamination. Clarification will also be required to deliver improved performance on pathogenic organisms and, above all, on parasitical protozoa such as Giardiaand Cryptosporidium, with a 0.1 NTU turbidity objective: thus, we end up in a “multiplebarrier” treatment concept combining solids-liquid separation of particulate contaminants, polishing treatment to remove dissolved contaminants and disinfection via physical or chemical means. As previously observed for clarification strategies, the challenge of removing dissolved contaminants (organic matter, micro-pollutants) calls on a range of weapons that the water specialist can use separately or in combination, but most frequently in multiple successive stages. This section primarily concerns oxidation with ozone used for polishing. This oxidation converts high gramme-molecular weight molecules into smaller molecules.Therefore, very special attention has to be paid to the properties of the byproductscreated in this way as they can be just as “undesirable” as the initial product(s). This specifically applies to triazine-type pesticides (atrazine, simazine) where the ring formed by the three nitrogen atoms is not broken down by conventional oxidation (ozone, ozone plus peroxide) but, starting with atrazine, for instance, will result in the formation of desethyl- or deisopropyl-atrazine. Consequently the Perozone (O3 + H2O2) process is banned in France for the treatment of water containing pesticides. However, the effectiveness of ozone on organic molecules comprising dual bonds (chlorinated solvents such as trichloroethylene, tetrachloroethylene) or aromatic rings (phenols or some NOM) should be noted. Such compounds are converted by ozone into more easily biodegradable molecules; when followed by biological filtration, ozone eliminates most THM precursors. Furthermore, ozone considerably improves water odours and taste but it should be recalled that if the level of treatment applied is too low, the breakdown of some organic products will lead to the formation of compounds that can impart a taste to the water (ketones, aldehydes). In such cases, the ozone dosage and/or contact time should be increased in order to achieve good quality of water. The amount of ozone that needs to be used for treating a given water should be established through laboratory testing (see section specific analysis). Adsorption strategies include the use of granular activated carbon ( GAC ), powdered activated carbon ( PAC ), or more rarely resins that have extensive specific surface areas (porosity) and active sites that will fix dissolved molecules, thus removing them from the medium to be treated. adsorption describes the physical-chemical phenomena of adsorption using PAC or GAC and their application principles; biological phenomena will often apply with GAC filters, especially after the ozonation stage (see "CAB" in the section the BAC (biological activated carbon concept)). Finally, GAC filters (Carbazur) are reviewed in the section carbazur activated carbon filters GH. 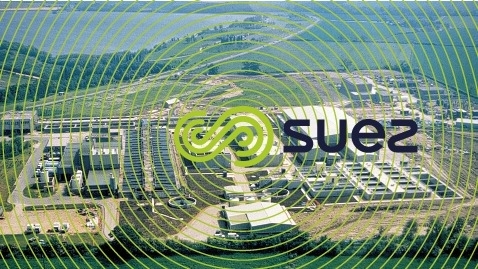 In a treatment system, PAC is introduced upstream from the settling basins; Pulsator sludge blankets or their lamellar derivatives provide the best support for this system’s action. or after fast filtration through sand and, if possible, ozonation: "second stage filtration through GAC" (mainly plays a polishing role, far more preferable in terms of effectiveness and carbon service life); in this case, a 0.75 mm ES media is used. An adsorbant’s effectiveness is expressed by its capacity (mass of micropollutants removed per unit of adsorbant mass); however, very significant disparities have been recorded between results obtained from laboratory measurements using distilled water and those obtained in real situations where the micropollutants coexist in the raw water with a complex organic matrix. In view of the considerable differences that can be observed between the concentration and gramme-molecular weight for various pollutants (NOM, pesticides, molecules that impart taste…), one needs to allow for adsorption kinetics on the one hand and for competition phenomena on the other. This requires the water specialist to separate the operations, with a complete as possible removal of DOC via coagulation at acidic pH and adsorption within the metal hydroxide (floc), followed by fixation of the remaining molecules on PAC or GAC. The GAC’s service life will depend on the operating parameters and, above all, on the compounds adsorbed. Low polarity products are easily adsorbed. Large macromolecules tend to clog the pores and reduce service life because not all the surface area is used. The carbon’s structure also plays a part in its service life: carbon that has small pores (coconut type) will quickly become saturated even when its capacity, measured in the laboratory with small molecules (e.g. iodine index), is high. 3 to 4 years for removal of tastes and odours. 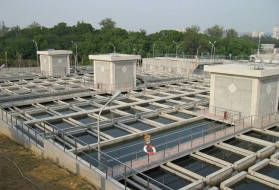 Throughout its operation, a GAC filter bed must be backwashed at regular intervals in order to remove suspended solids (and even micro-organisms such as Rotifers, Nematodes, Oligochetes…) which, in the absence of such backwashes, could accumulate between the grains (first stage: 1 wash every 24 to 48 hours; second stage: 1 wash every 1 to 2 weeks). The activity of biological filters (see biological engineering applications in potable water treatment) serves to transform unwanted molecules or ions into by-products that usually have no negative effect on water quality. This applies to ammonium salts (NH4+) that are converted into nitrates (NO3–); nitrates that may be reduced to form nitrogen (N2); biodegradable dissolved organic carbon (BDOC) that is metabolised by heterotrophic bacteria in the BAC. Each treatment calls for pH/Redox potential/Dissolved oxygen/Temperature/Contact time conditions, together with a support medium for the bacteria, all specific to that treatment (see biological engineering applications in potable water treatment). BAC (see following) in particular, always plays a dual role: adsorption and biological elimination of BDOC, sometimes also described as an adsorption followed by a biological regeneration of the carbon. As part of the systems most frequently used to produce drinking water from contaminated surface water, a stage where the carbon is biologically degraded through activated carbon filters is often included; with this step usually following a “controlled” ozonation stage (see the «CAB concept», in section the BAC (biological activated carbon concept)) : this is an extremely important term because, during this process, the creation of unwanted by-products (bromates) must be avoided by regulating pH, contact time and the residual oxidant level, while encouraging the action of the downstream biological reactor (oxygenation, disinfection to avoid the proliferation of pathogenic germs, improved biodegradability…). 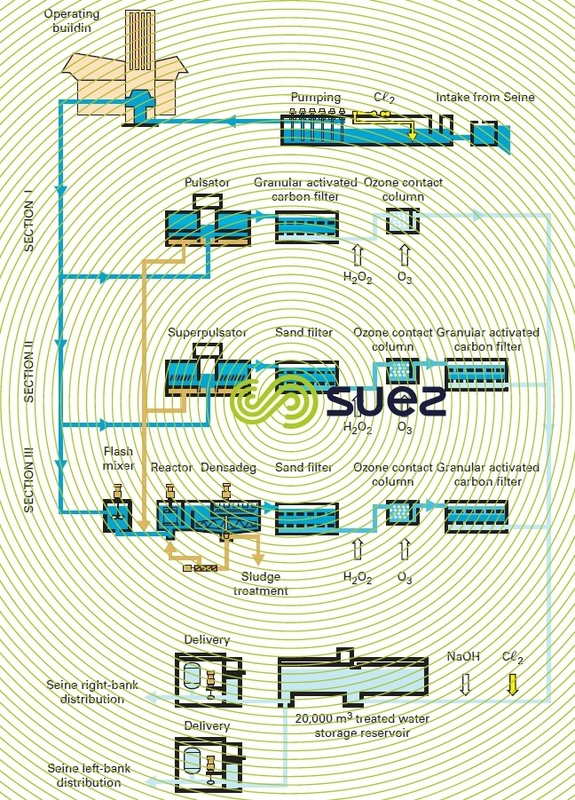 The Morsang (France) I-II and III plants (photo 9 and figure 9) illustrate the changes applicable to this type of system; initially (phase I), ozone was used exclusively as a simple disinfectant and formed the final step in the treatment; in order to address a deterioration in the quality of the resource and a more stringent requirement in terms of treated water stability within the mains distribution system, a granular activated carbon filtration stage was added after ozonation in phases II and III. This also applies to many plants constructed during the 1960’s and 70’s that were upgraded in this manner (e.g. in France: Limoges, Metz, Orly…), as well as more recent plants where the treated water quality has had to satisfy even more stringent requirements, e.g. Kota Tinggy (Malaysia), (see photo 13 in section sludge blanket settling tanks), (achieving a turbidity level < 0.1 NTU); Grafham (UK), photo 10, (pesticide guarantee). Most of these plants use ozone + GAC polishing that also includes pre-ozonation upstream of clarification. 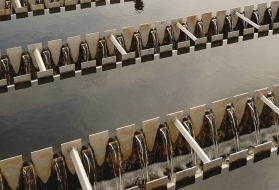 The Mont Valérien plant (1985) near Paris is fed with raw water from the Seine river; this plant was one of the first to use this system design (figure 10) which is now representative of the typical treatment applied to contaminated water (excluding membrane treatments). 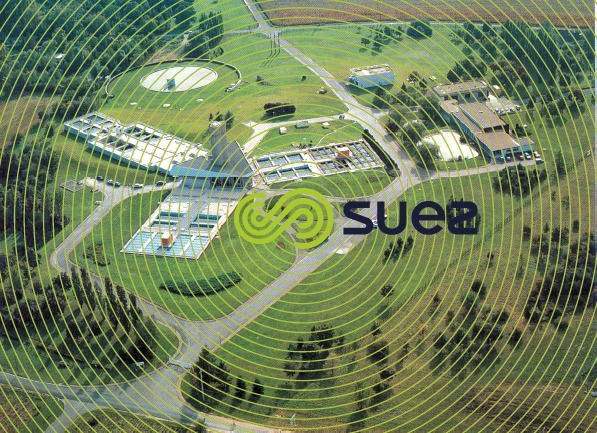 Moreover, this system design was used again for the second phase (1995) of this installation but also included Densadeg clarification (restricted space) and nitrification (LFN, see section eliminating ammonium) using Biolite instead of filtration through sand: the results were outstanding despite the contaminant levels in the raw water (Seine river water downstream from Paris), see table 5.